Pinnacle Ash is a bike model for kids. It’s intended for young cyclists who are ready to transition to proper bikes from balance bikes or training wheels. These bikes come with a simple design that makes learning to ride easy for the little ones. 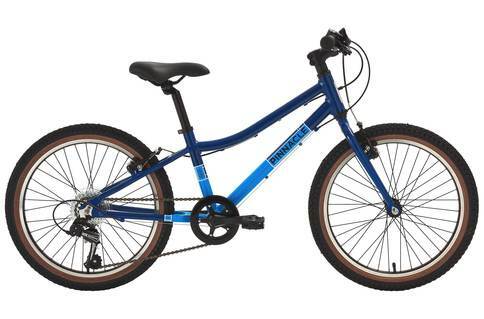 Pinnacle Ash offer a range of training bikes for kids. These bikes are suitable for learning as well as having fun as little cyclists. These bikes are not balance bikes however, and do not come with training wheels wither. Ash bikes are suited for kids who can already balance themselves on two wheels. Ash bikes are like smaller versions of proper bikes for the most part. If you are a parent who wants to transition a child from training wheels to proper cycling, then this model will be highly suitable. We had several little cyclists test the model for our review. The most notable aspect of Ash bikes is that they come with lightweight alloy frames. Kids bikes are not necessarily lightweight just because the models are smaller. Our reviewers constantly praised how lightweight these bikes felt. The bikes have BMX inspired small block-type tires. The tires allow for riding in a variety of terrains, including sidewalks, grassy lawns, and dirt roads on outings. These bikes come with twin chain plates. This prevents the chains from derailing and having parents end up with greasy hands. The bikes have rear-only gears. The idea is to make the bikes easier for learning with simplified design. This model forgoes the suspension in favor of a rigid fork. That’s definitely advantageous for kids when they try to learn. Our tested didn’t have any trouble speeding and spinning on these bikes. The bikes have really powerful midi-v brakes so parents won’t have to worry about speeding. The only issue we had was the price, which we thought was a bit too much for a kids bike model. Pinnacle Ash is a really excellent kid’s bike model, in our opinion, despite the price tag. These bikes are carefully designed to make learning easy. The bikes are not for absolute beginners who don’t know yet how to balance. The Ash bikes do come with simplified geometry that makes mastering the basics easier.